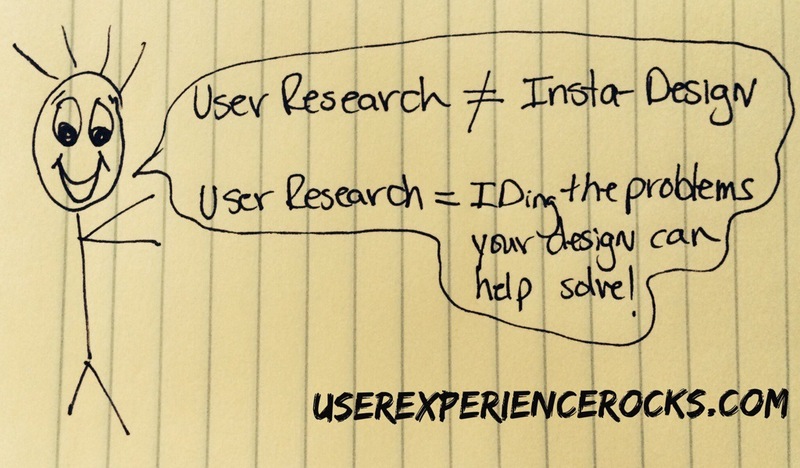 User Research Doesn’t = Instant Designs, It Identifies Problems Your Designs Can Solve! When conducting user research you need to talk to your users to find out what their problem areas are. User research is an incredible way to gain insight into what your clients need, and where your product pain points are, but you have to ask the RIGHT QUESTIONS. You can’t just ask, “What do you want me to make for you next?” If that’s how you’re conducting user research, you’re doing it wrong. User Research and Usability Testing are the core of UX design, but they’re steps that lead the design process; they aren’t the entire process itself. You need to ask what kinds of problems your users are facing, so that you can bring that information back to your design team to brainstorm ways you can help SOLVE those problems. Every design we work on, the first thing my VP says during a brainstorming meeting is, “Which user problem are we trying to solve here?” We focus on coming up with the best solution to the problem and weave it into a killer product or feature. Could we ask, “What do you want us to make you next?” Absolutely, our clients would tell us. We could build exactly what each client asks for, but we’d end up with a bunch of similar yet slightly different features, since user needs vary greatly. By asking about the problems our clients face, we are able to identify trends in the market. “Look, 75% of the clients we interviewed are facing a similar problem, lets design a solution to address it!” Boom. Happy clients, designers with the freedom to come up with innovative solutions, and fab product results. I’m not saying that you can’t ask clients what they want, and then make enhancements based directly on that feedback. The clients are the ones using the product day in and day out, they know when something isn’t usable. I’m saying that if you ask your clients what they want you to change, you need to follow up with a question asking WHY they want it to change, to ensure that you’re not just putting a band-aid on something that needs a complete facelift. In my opinion, Henry Ford (?) was correct in that user research is not a process of making users design their own solutions. Getting the feedback, “I want a faster horse,” means horses aren’t fast enough for the users. The problem is speed, user research = successful. Then you design a faster, innovative solution – the Model A, later the mega popular Model N, and even later the famous Model T.
Thanks, it’s a really great article. Is it any post here, that help to formulate the right questions, and may be different ways to ask those question?